Jaeger-LeCoultre have enjoyed steady success in SIHH through the years. They gave their Master Control series a fresh new design in 2017, and added the Polaris collection in 2018. While these moves were more “marketing” than “watchmaking”, they were applauded by the watch community, and deservingly so. This year, the “Grande Maison” focuses on what it does best, by presenting what was the most technically complicated wristwatch at the Salon. 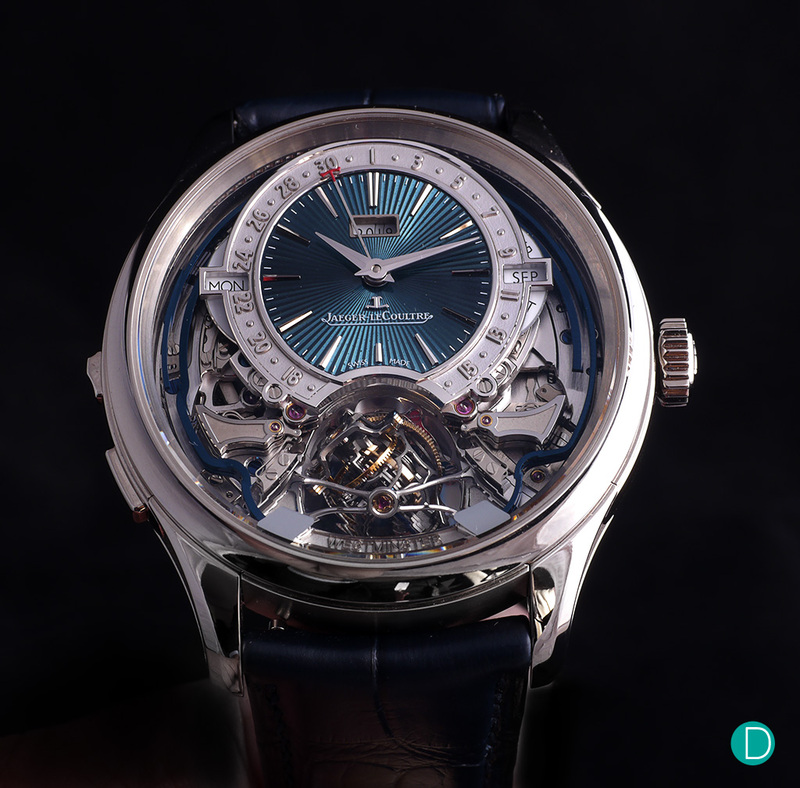 Here, we bring you the details and our thoughts on the new Jaeger-Lecoultre Master Grande Tradition Gyrotourbillon Westminster Perpétuel. The 18K white gold case of the new Master Grande Tradition Gyrotourbillon Westminster Perpétuel measures 43.00 mm in diameter and 14.08 mm in thickness. Considering the complexity that the watch entails, its dimensions is evidence of restraint and skill on the manufacturer’s part. Apart from having a decently wearable size, the case is also elaborately constructed and finished. To preserve the smooth lines of the case, the watch utilises a retractable minute repeater pusher, first seen in the Master Ultra Thin Minute Repeater Flying Tourbillon. The case surfaces are adorned with multiple types of finishes, from mirror-polishing to straight-graining and fine hammering. Suffice to say, this may be the brand’s most gorgeous case yet. The dial of the Master Grande Tradition Gyrotourbillon Westminster Perpétuel is largely openworked, revealing all the intricacies of the movement. What can be considered the dial proper is a sub-dial that displays the hours, minutes, as well as the day, date, month, and year of the perpetual calendar. Two different variations of the dial proper are available: the first, a blue grand feu enamel dial with sunray-motif engraving, and the second, a classic silver-grained dial. Indicating the time are two dauphine hands (white gold on the blue dial, blued steel on the silver dial) while the perpetual calendar is displayed by means of a radial hand with a red ‘JL’ tip for the date, and apertures for the other indications. The date track that encircles the dial proper is relief-engraved, which we must say, looks great. To avoid obstructing the view of the Gyrotourbillon at 6 o’clock, the track is designed with a gap between the 16th and 17th of the month. The date hand would simply jump between the two dates. This has been implemented in other Jaeger-LeCoultre references, but is especially fitting here. Outboard of the dial proper, everything you see is part of the movement. 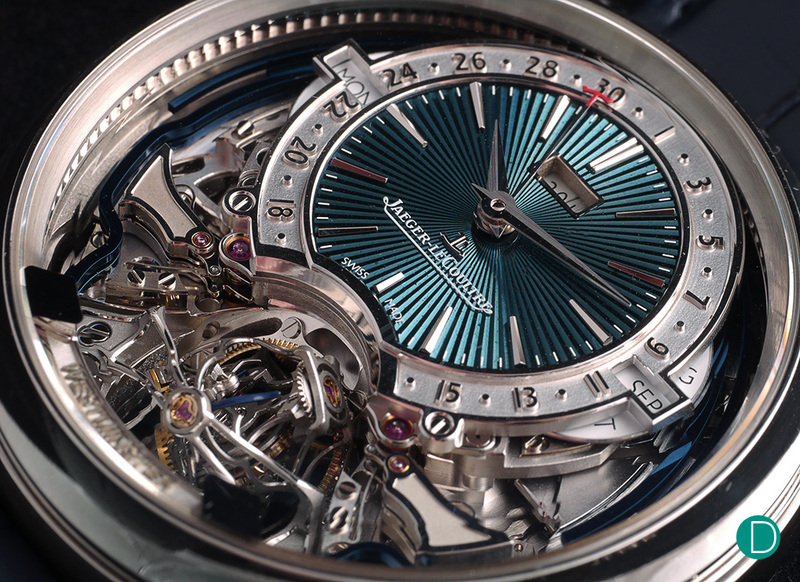 The most prominent sights include the striking blued gongs (pun not intended), trebuchet hammers, and of course, the gyrotourbillon. Two dial options are available: engraved blue enamel, or silver-grained, the latter being more legible with blued hands and indices. Fasten your seat belts because this is one hell of a calibre. 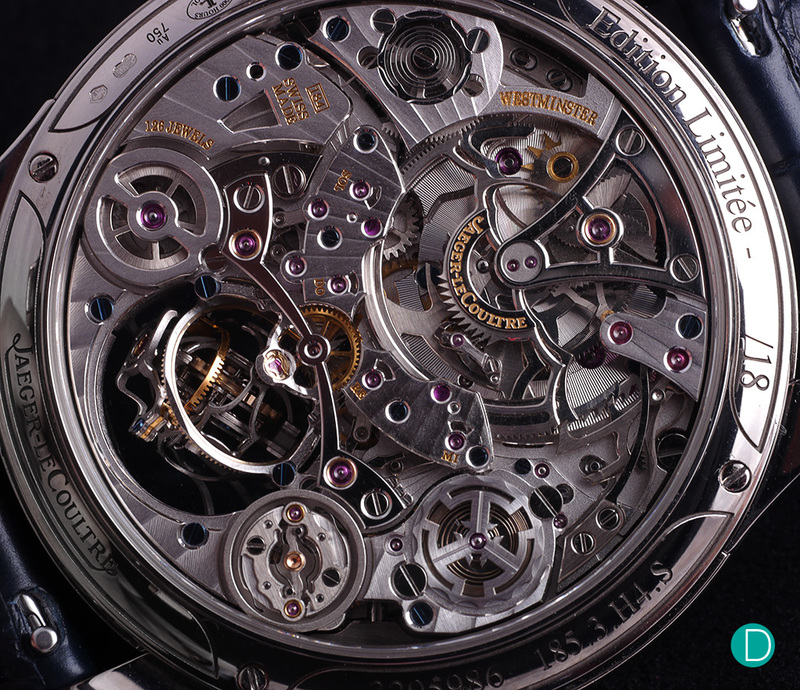 The in-house Calibre 184 that beats within comprises a whopping 1005 parts, including 137 jewels. It is manually wound and has a power reserve of 52 hours off of twin mainspring barrels. 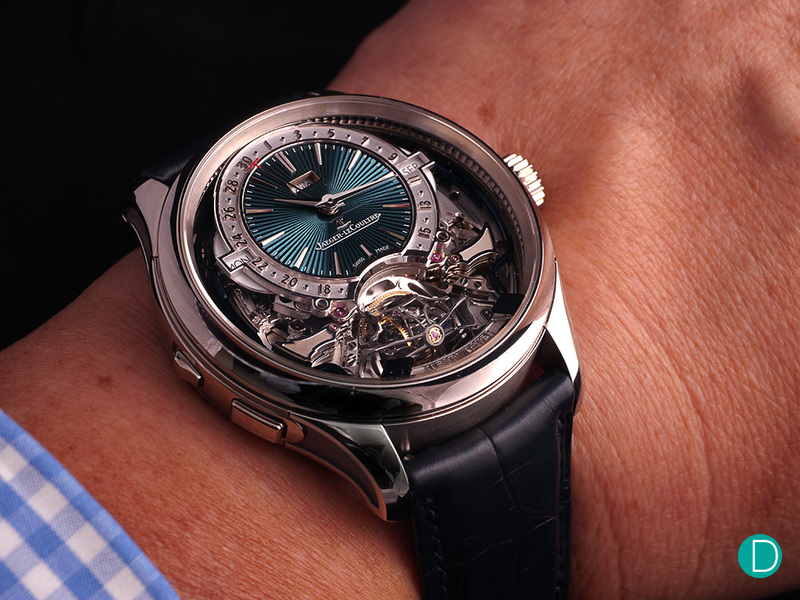 Being the fifth watch in Jaeger-LeCoultre’s Gyrotourbillon series, the Master Grande Tradition Gyrotourbillon Westminster Perpétuel features the brand’s famed multi-axis tourbillon that is now smaller than those found in its predecessors. As a rule, reducing the size of a mechanism also reduces its error tolerance, which is why successful miniaturisation efforts are so highly valued in watchmaking. In creating a smaller tourbillon, the manufacture has created a wearable Gyrotourbillon piece, bringing high complication out of the watch safe and onto the wrist for everyday wear. 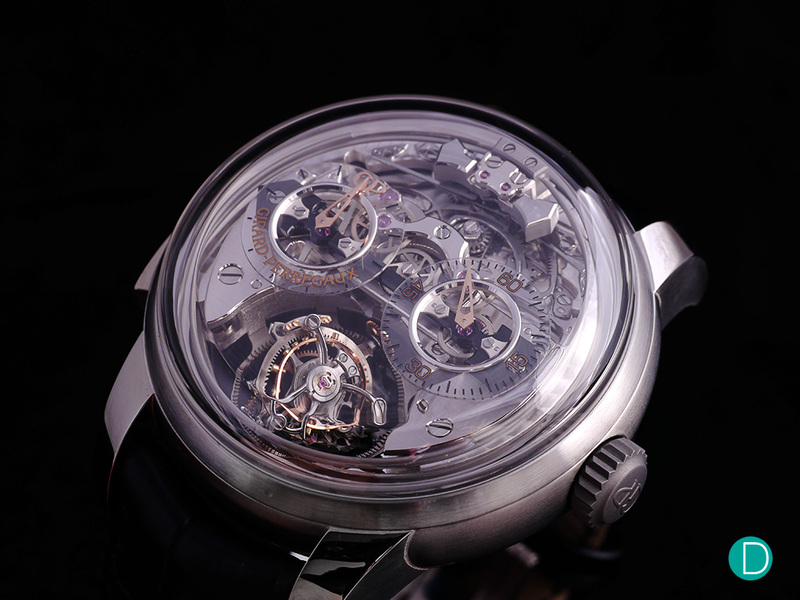 The multi-axis tourbillon, or in Jaeger-LeCoultre speak, the Gyrotourbillon, was miniaturised in order to fit inside the case along with other high complications of the piece. The Calibre 184 is equipped with four sets of gongs and trebuchet hammers to create the iconic Westminster chime (think Big Ben) to indicate the quarters when the minute repeater is activated. While not a first for Jaeger-LeCoultre, the Westminster carillon minute repeater is fairly rare due to its added complexity over regular minute repeaters. Its four-phrase melody is composed of four notes played in different sequences and different quantities at each quarter of the hour. So as to not mar the beauty of the chiming, a “silence-reduction” function was also built into the mechanism. This ensures that even when the full set of Westminster quarters is not struck, there is no awkward delay between the quarters and the minutes. 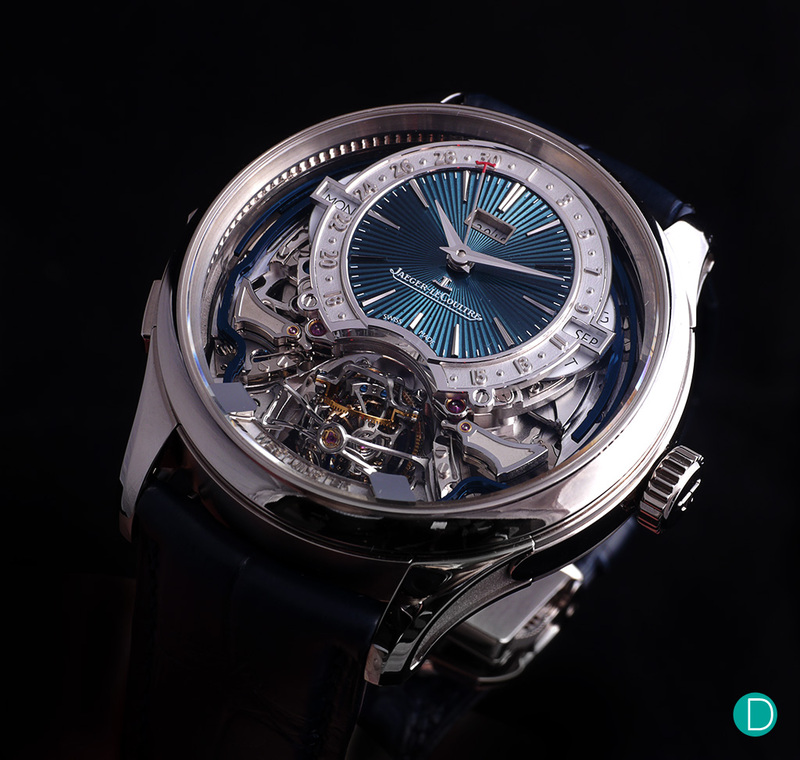 Another Jaeger-LeCoultre innovation that has found its way into the the Calibre 184 (and previous minute repeater models since 2005) is the ‘crystal gong’. Not to be confused with gongs made of actual sapphire crystal like in Chopard’s Full Strike watch, the Grande Maison’s crystal gong innovation involves welding repeater gongs to the dial crystal of the watch, capitalising on the superlative sound transmission qualities of synthetic sapphire crystal to amplify volume and enhance clarity. Perhaps the most underrated feature of the Calibre 184 is the one-minute constant force mechanism. The mechanism provides a consistent level of power to the energy-hungry tourbillon throughout the movement’s entire power reserve, leading to better timekeeping. A spring within this mechanism, called a remontoir, is periodically re-armed by the mainspring and acts as a secondary power source to protect the regulating organ of the movement. The other function of this constant force mechanism is to regulate the motion of the minute wheel, creating a jumping minute hand that offers precise time display. More importantly, the mechanism that controls the minute strike is linked to the minute jumping system. This eliminates the chiming error that arises when the repeater is activated between minutes, resulting in a one minute difference between the chime played and the time shown. While the constant force mechanism is the most unassuming perk of the Calibre 184, the perpetual calendar is the most pragmatic. The perpetual calendar automatically displays the correct date without the need for manual adjustment between months of different lengths; it even takes leap years into account. The perpetual calendar mechanism in the Calibre 184 can not only be set forwards, but also backwards. The Calibre 184 does not let up on aesthetics and finissage either. If anything, it is likely the most well-finished and most architectural wristwatch movement ever created by the Le Sentier manufacture. The movement is selectively openworked not just for aesthetics, but also to offer visibility of normally unseen components (the repeater spring barrel, for instance). There are impeccably black polished bridges that contrast against other bridges that have been decorated with sunburst waves. And always a sight for sore eyes, the Calibre 184 abounds with not just exterior, but also interior angles – the latter a true hallmark of ultra high-end watchmaking. No holding back. The finissage applied onto the Calibre 184 is truly superlative, with numerous acute angles, black polished parts, and openworked structures. The Master Grande Tradition Gyrotourbillon Westminster Perpétuel is an 18-piece limited edition watch with a retail price of CHF800,000. An obscene amount of money, but at the same time, a reasonable price tag for the watch in the current market climate. While there aren’t really any functionally identical watches out there available for comparison, there are certain pieces that bear some similarity. The watch fits well on the average wrist, which is a job well done by the manufacture given the enormous complexity of the piece. One example is the Girard-Perregaux Minute Repeater Tri-Axial Tourbillon, last year’s SIHH novelty. The watch could perhaps be thought of as a ‘lite’ version of the Jaeger-LeCoultre. While it too has a mesmerising multi-axis tourbillon, the Minute Repeater Tri-Axial Tourbillon has “just” a regular minute repeater, and no perpetual calendar function. Crafted in titanium, the watch is indeed “lite” in every sense of the word. The design of the Girard-Perregaux Minute Repeater Tri-Axial Tourbillon is stunning, with transparency apparently being the main theme. The watch effectively has no bezel, so the dial – or rather, the movement – get’s the lion’s share of real estate. Even the sub-dials are made of sapphire crystal so that the view of the movement is not impeded. The sheer depth of the movement is magnificently highlighted by the box-type sapphire crystal on the dial-side of the watch. The only downside we can think of is its ridiculous size of 48 mm – too big for most wrists. Last but not least, it is worth keeping in mind that the watch “only” costs a fraction of the Jaeger-LeCoultre, at CHF360,000. In our opinion, the price is a fair one for what is being offered under the hood, and based on what others are charging. 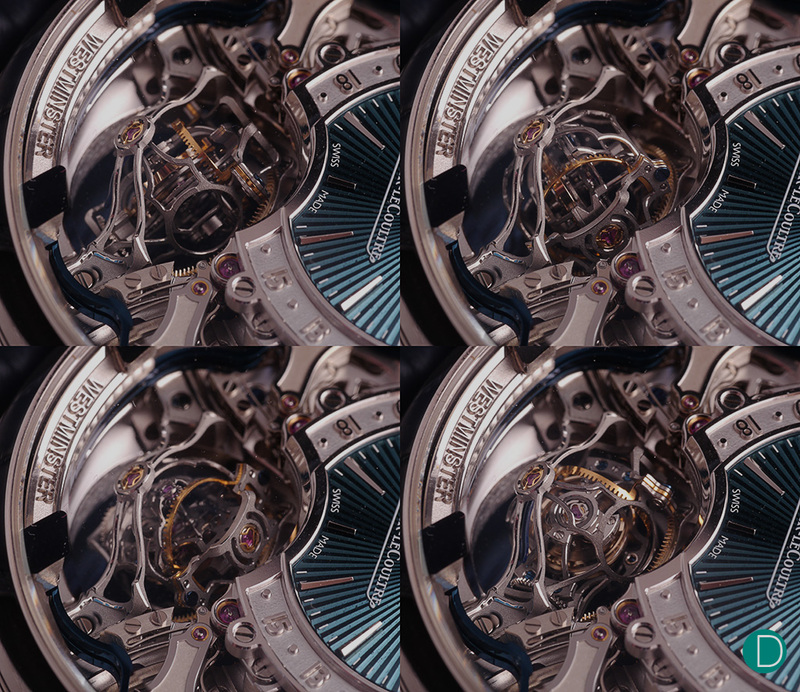 Girard-Perregaux Tri-axial Minute Repeater is a watch with no secrets – everything is revealed. If neither the Master Grande Tradition Gyrotourbillon Westminster Perpétuel nor the Minute Repeater Tri-Axial Tourbillon are opulent enough for you, there’s the Greubel Forsey Grande Sonnerie, available at limited production for the price of both! As far as watch complications go, the grande sonnerie is perhaps the most difficult to master, with only a few manufactures – Jaeger-LeCoultre included – having achieved this feat. 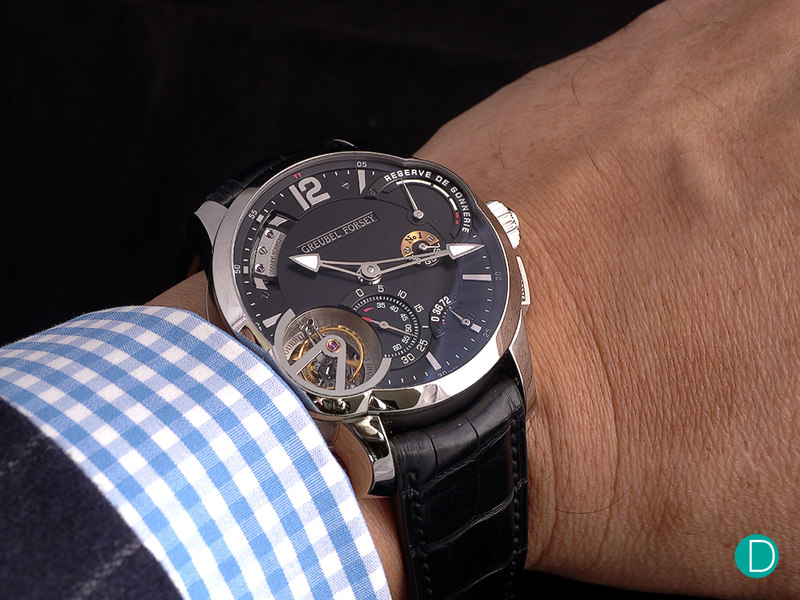 Through the Grande Sonnerie watch, Greubel Forsey has joined a truly rarefied company of watchmakers. The watch can be switched between “grande sonnerie”, “petite sonnerie” and “silent” modes, and also has a minute repeater function. Instead of regular gongs, cathedral gongs are used for a richer tone. While not exactly a multi-axis tourbillon, the Greubel Forsey Grande Sonnerie does showcase a fast, 24-second inclined tourbillon. The most underrated thing about the piece is its numerous safety features, one of which disengages time-setting when the watch is chiming. Many of Greubel Forsey watches are built with these safety mechanisms and they save countless clients from the heartache of a broken watch and its associated repair costs. The Greubel Forsey Grande Sonnerie is also fitted with a striking power reserve indicator and a regular power reserve indicator. 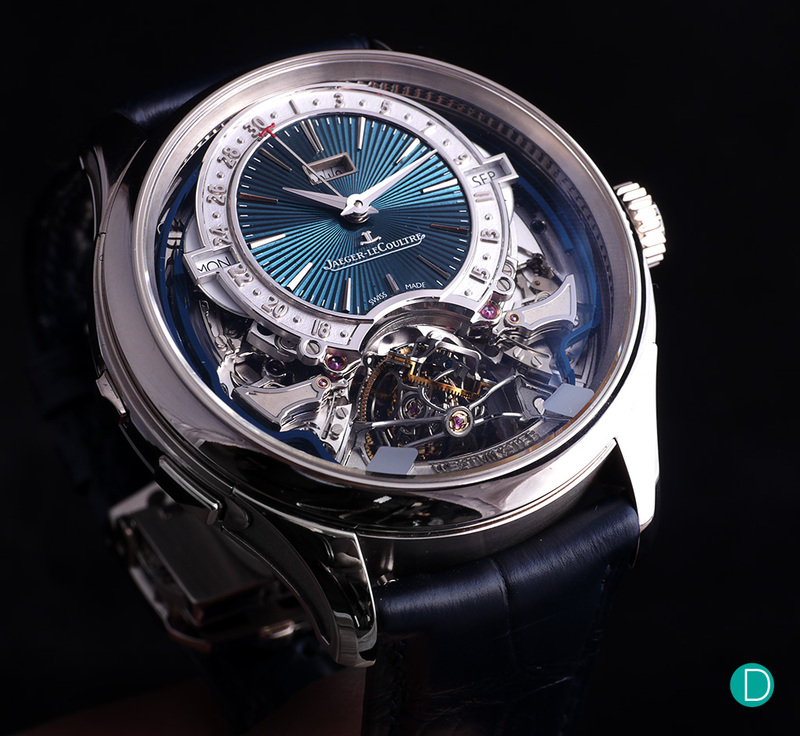 In the Master Grande Tradition Gyrotourbillon Westminster Perpétuel, Jaeger-LeCoultre have a serious contender for this year’s GPHG Aiguille d’Or prize. Sure, there isn’t anything too inventive about the movement, but it contains some of the brand’s best innovations throughout the years. And the fact that everything fits seamlessly within a relatively confined space of 43.00 mm x 14.08 mm is worthy of praise.